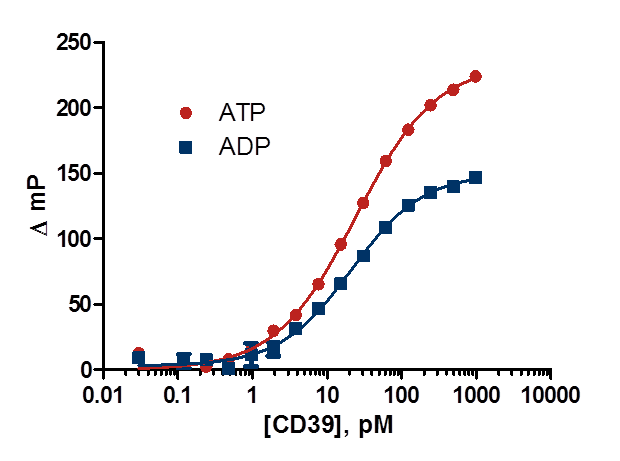 The Transcreener AMP CD39 Assay directly measures cyclic AMP produced by ectonucleoside triphosphate diphosphohydrolase-1 (also known as ENTPD1, NTPDase1, Cluster of Differentiation 39 or CD39). 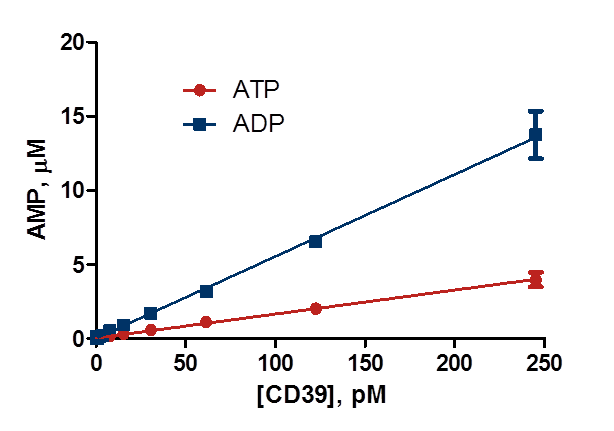 By measuring the production of AMP researchers can effectively determine the activity of the CD39 enzyme. The assay provides a powerful tool to screen entire compound libraries for CD39 modulators to help find new therapeutics for diseases such as cancer. Ectonucleotidases are plasma membrane-bound enzymes with externally oriented active sites that metabolize nucleotides to nucleosides and are crucial for maintaining immune homeostasis. CD39, hydrolyzes ATP and ADP to AMP. AMP can further be processed to adenosine leading to a significant impact on many disease states. Recent studies have shown a key role for adenosine in immunosuppression in the tumor microenvironment, and ectonucleotidases are emerging as promising immuno-oncology targets. The Transcreener CD39 Assay is in a simple, HTS-ready, mix-and-read format. Run your enzyme reaction, add Transcreener reagents, and read your plates. The assay is compatible with 96, 384, and 1536-well formats. 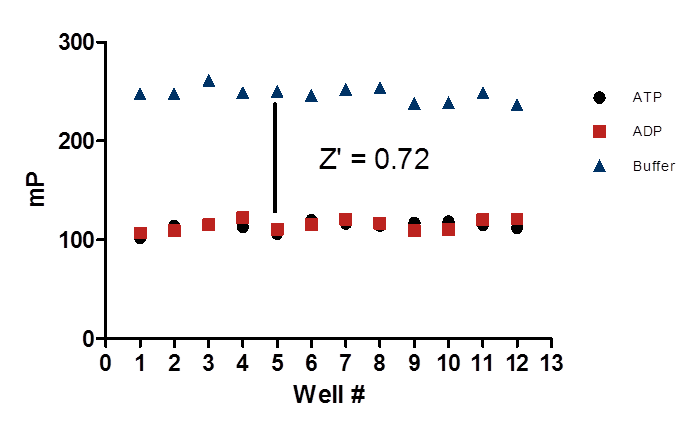 The assay demonstrates linearity when raw data is converted to AMP using a standard curve. CD39 can use a variety of substrates. Here both ATP and ADP are shown under initial velocity conditions. The Transcreener CD39 Assay is designed for screening compound libraries in a high throughput format. Follow up SAR can also be performed using the assay to determine inhibitor potency with ease. 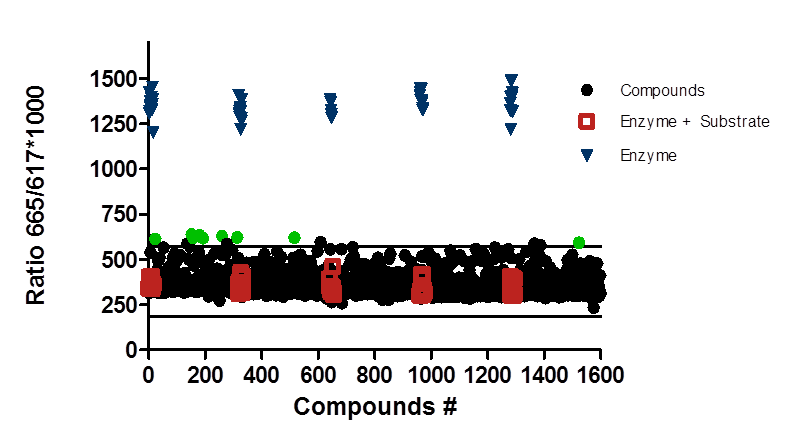 A 1600 compound subset from Chembridge Diversity Library was screened using CD39 and ATP in the Transcreener TR-FRET format resulting in 8 hits shown in green. 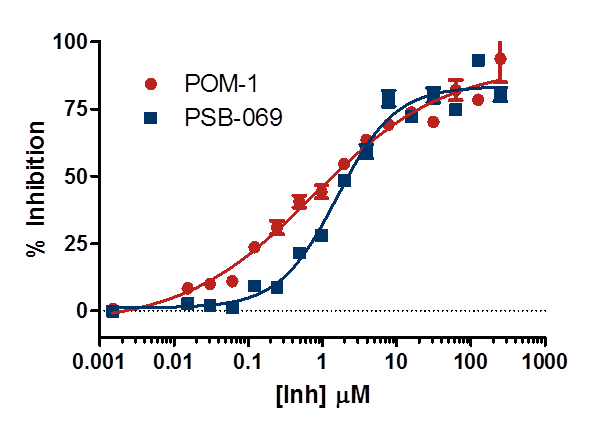 Z’ measurements using optimized CD39 reaction conditions indicate a robust assay. Robust data like this is vital for sizeable high throughput screens that are difficult to complete due to massive sample quantity. Both ATP and ADP produce excellent results. AMP Antibody Antibody specific to the nucleotide AMP. AMP Tracer When displaced, changes in fluorescence can be read in an FP or TR-FRET depending on the assay format. Tris Solution Tris solution is used to buffer the detection mixture. AMP AMP is used to create the ATP/AMP or ADP/AMP standard curve. CD39 Enzyme We have successfully used recombinant human CD39 from R&D Systems Cat. #4397-EN. Enzyme Buffer We have had success with a 50 mM Tris, 10 mM CaCl2, and 0.01% Brij-35 buffer at pH 7.5. ATP or ADP Use the nucleotide required for your experiment. It is possible to purchase nucleotides direct from BellBrook Labs.